This movie, directed by Emily V. Driscoll, is an award-winning short documentary that follows NYC sci-artist Mara G. Haseltine as she creates a sculpture to reveal a microscopic threat beneath the surface of the ocean. The film features Mara G. Haseltine, Christian Sardet (The Plankton Chronicles, TARA Oceans) and Mark Anthony Browne (Ecologist NCEAS). The Raja Ampat Islands, an Indonesian archipelago, known for coral reefs rich with marine life. So say the scientists behind the 2016 Ocean Health Index (OHI), an annual study that evaluates key aspects—biological, physical, economic and social—of ocean health worldwide. The OHI defines a healthy ocean as one that sustainably delivers a range of benefits to people now and in the future based on 10 diverse public goals. This year's score is 71, unchanged from those for 2013-2015, which were recalculated using the current year's improved methods. "We've given the oceans their annual checkup and the results are mixed," said UC Santa Barbara ecologist Ben Halpern, OHI chief scientist. "It's as if you went to the doctor and heard that, although you don't have a terminal disease, you really need to change your diet, exercise a lot more and get those precancerous skin lesions removed. You're glad you're not going to die but you need to change your lifestyle." A score of 100 means optimal productivity from the ocean in a sustainable way. Established in 2012, the OHI is a partnership between UCSB's National Center for Ecological Analysis and Synthesis (NCEAS) and the nonprofit environmental organization Conservation International. The index serves as a comprehensive tool for understanding, tracking and communicating in a holistic way the status of the ocean's health. 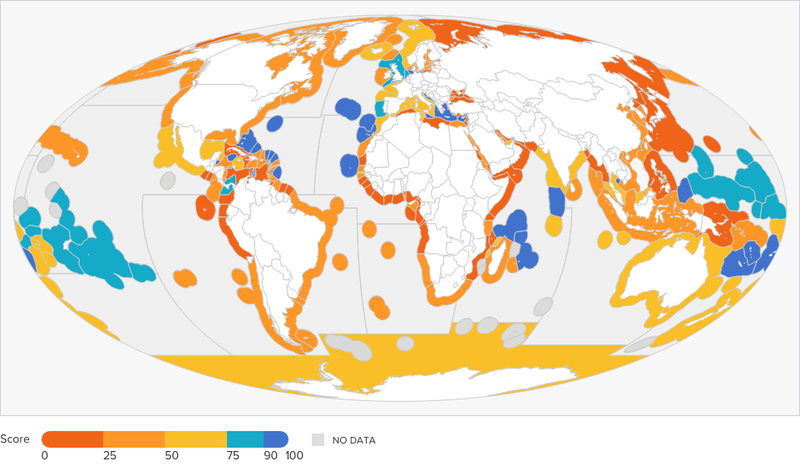 It also provides a basis for identifying and promoting the most effective actions for improved ocean management on subnational, national, regional and global scales. Two exclusive economic zones (EEZs) demonstrate higher scores and therefore better efforts at sustainability. For example, Germany, with a population of 81 million, ranked fourth among the 220 EEZs assessed with a score of 85. The much-less-populated Seychelle Islands (with about 97,000 people) ranked eighth with a score of 84. These areas exemplify effective social and environmental governance systems for improving ocean health. Successive years of global OHI assessments also identify potential trends. The Livelihoods & Economies goal, for example, showed the most rapid score increase between 2012 and 2013, possibly reflecting recovery from the recession that began in 2008. Lasting Special Places (a subgoal of Sense of Place) scores improved by an average of 0.5 points per year, likely due to the designation of marine protected areas. Consistently low scores for Tourism & Recreation (47) highlight countries that are not sustainably maximizing benefits derived from a healthy tourism sector. 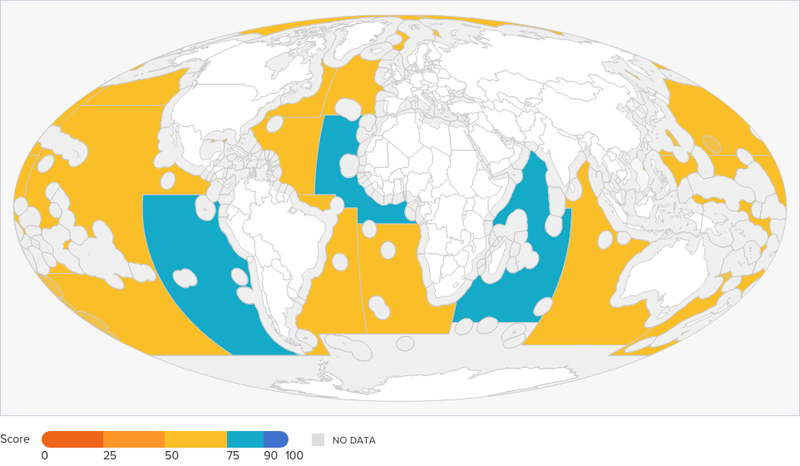 Scores for Food Provision (54) and Natural Products (48) indicate that many regions are either harvesting unsustainably or not maximizing their sustainable potential to produce more food from the sea. 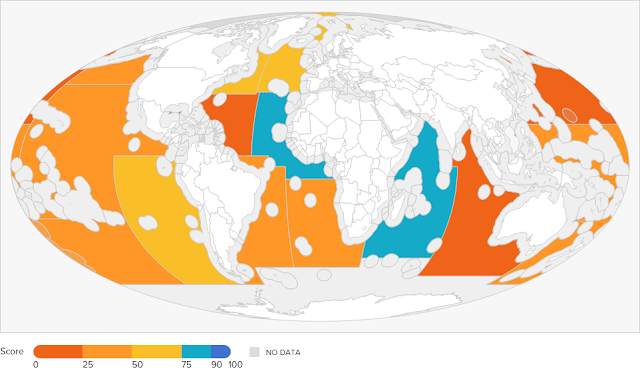 The overarching issue of poor quality data (or no data at all) limits the ability to estimate the status of fish stocks in many regions as well as the overall status of fisheries. Biodiversity (91) and Coastal Protection (87) goals remain the highest scoring. Reference points for both include maintaining coastal habitats at or about their 1980 levels, so decline of these scores from 100 has occurred in less than four decades. Continuing threats to habitat could lower scores further. The OHI team works directly with more than 25 countries across priority marine regions, including the Pacific, East Africa and Southeast Asia. 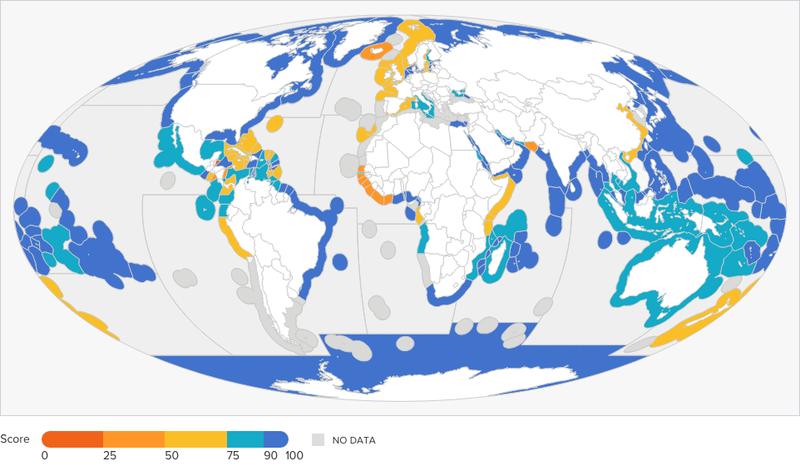 Nations in these areas lead independent assessments known as the OHI+, which have already driven marine conservation actions at national levels by shaping China's 13th five-year plan, Ecuador's National Plan for Good Living and Mexico's National Policy on Seas and Coasts. 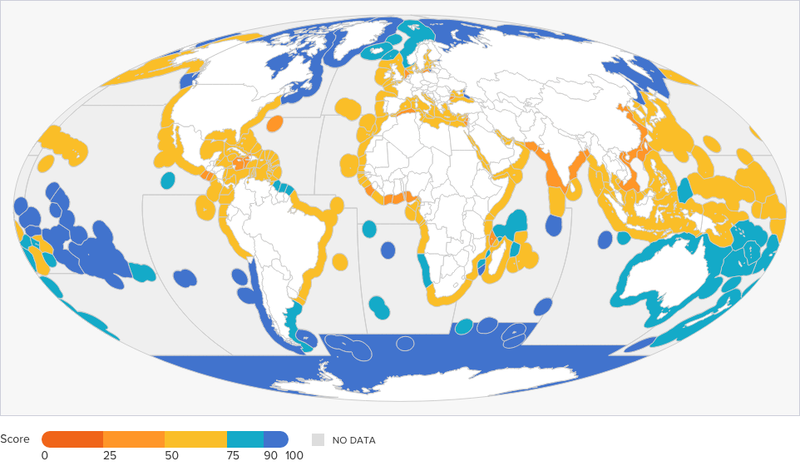 "We believe the Ocean Health Index gives reason for hope by providing a detailed diagnosis of the state of ocean health and also a framework that allows countries to identify and prioritize the most necessary resilience actions to improve ocean health," said Johanna Polsenberg, senior director of governance and policy for Conservation International's Center for Oceans. "This is where our work is most valuable. It may take some time for such actions to be reflected in the scores—but the steps being taken are essential to ensure a healthy ocean into the future." NIWA’s flagship research vessel returned to port in Wellington today after a two-week voyage, initially to undertake seismological research on the Hikurangi subduction zone, off the North Island’s East Coast which is regarded as New Zealand’s largest earthquake and tsunami hazard. However, with several leading marine geologists on board, it was decided to divert the ship to take core samples and survey the seabed in areas affected by the Mw 7.8 earthquake. Voyage leader and NIWA marine geologist Dr Philip Barnes said today new mapping and profiling confirmed that the Needles Fault ruptured forming newly discovered scarps on the seafloor along the Marlborough coast south of Cape Campbell. Dr Barnes said the length of the Kekerengu-Needles fault rupture may now extend for about 70km – 36km on land and 34km under the sea. 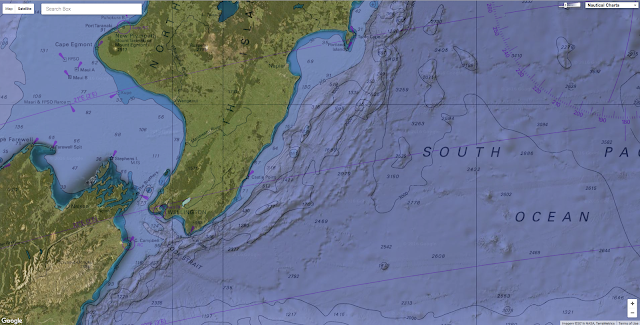 Scientists collected 61 sediment cores, each about 5.5m long from sites on the continental margin between the Kaikoura coast and Poverty Bay that will provide evidence of submarine landslides. The cores revealed the earthquake generated a huge turbidity current in the Hikurangi Trough, offshore from Marlborough and Wairarapa. A turbidity current is a rapidly moving underwater current comprising mud, sand, gravel and water. It eventually results in layers of sediment being deposited across the sea floor. These are known as turbidites. “We detected a very recent turbidite about 10-20cm thick over a very large region, extending at least 300km from Kaikoura. It is still settling on the seabed from the water column and may not complete this process for some time,” Dr Barnes said. The precise location of the underwater landslides that generated the turbidity current has not been studied. Data collected over the past few days will help inform understanding of the entire fault network activated during the earthquake. Dr Barnes said last week’s earthquake presented a rare opportunity to study how an area has been affected in real time. 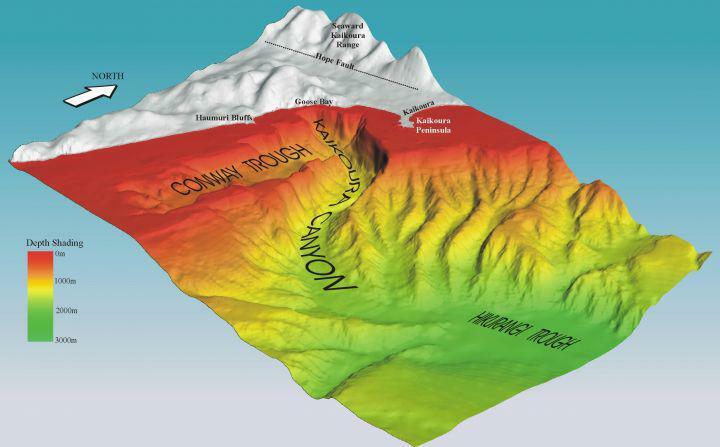 The voyage was funded by the Ministry of Business, Innovation and Employment as part of a five-year programme to address critical gaps in understanding about the earthquake potential of the Hikurangi subduction zone. This simulation shows how the seismic waves of the magnitude 7.8 earthquake were propagated across New Zealand. Subduction zones produce the planet’s deadliest earthquakes and tsunamis – such as the 2011 magnitude 9 earthquake in northern Japan and the M9.3 earthquake in Sumatra in 2004. These are known as “megathrust earthquakes”. The aim is to advance knowledge of the earthquake potential on the Hikurangi margin, to more reliably forecast the hazard it poses to New Zealand. 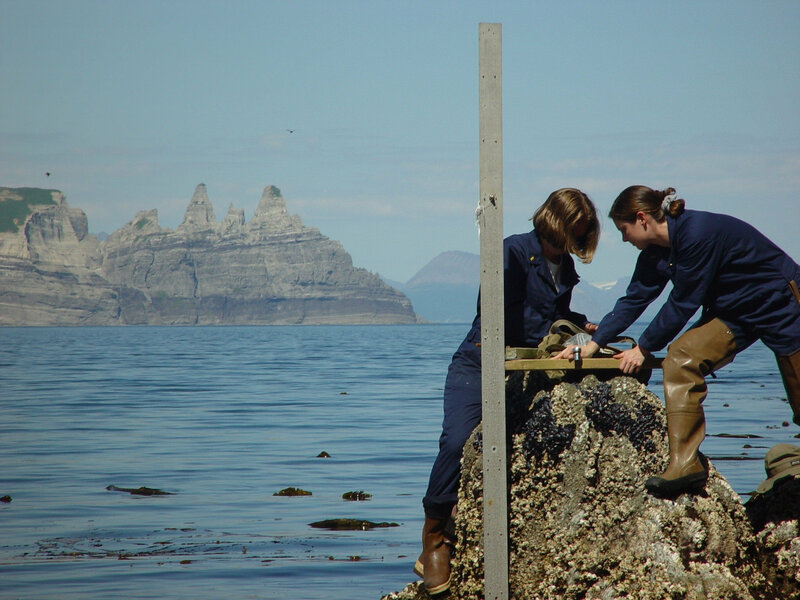 The research involves scientists from NIWA, GNS Science, the universities of Auckland, Otago, Canterbury and Victoria as well as scientists from France, Turkey, Japan and the US. On December 7, 2016, 75 years after the attack on Pearl Harbor, join us for a live dive on two Japanese mini submarines, the first of which was sunk by the USS Ward prior to the attack. This will be the first time the public will be able to view live underwater exploration of the submarines in real time. A team of maritime archaeologists and scientists from NOAA's Office of National Marine Sanctuaries and Office of Ocean Exploration and Research will live-stream the dive. A remotely operated vehicle deployed off of the NOAA Ship Okeanos Explorer will send back images of the wreck site. James Delgado, director of maritime heritage, NOAA Office of National Marine Sanctuaries and Frank Cantelas, marine archaeologist, NOAA Office of Ocean Exploration and Research will be on board, describing the exploration. "Until now, only a handful of explorers and scientists have seen these relics of the war in the deep sea," notes James Delgado, "but thanks to technology, anyone and everyone can now dive with us in the first live exploration of the 'midget' submarines that represent the beginning of the war in the Pacific." The research team will be using a remotely operated vehicle from NOAA Ship Okeanos Explorer to revisit the historic wreck site and document its condition. The dive will be live-streamed and the public is invited to participate. 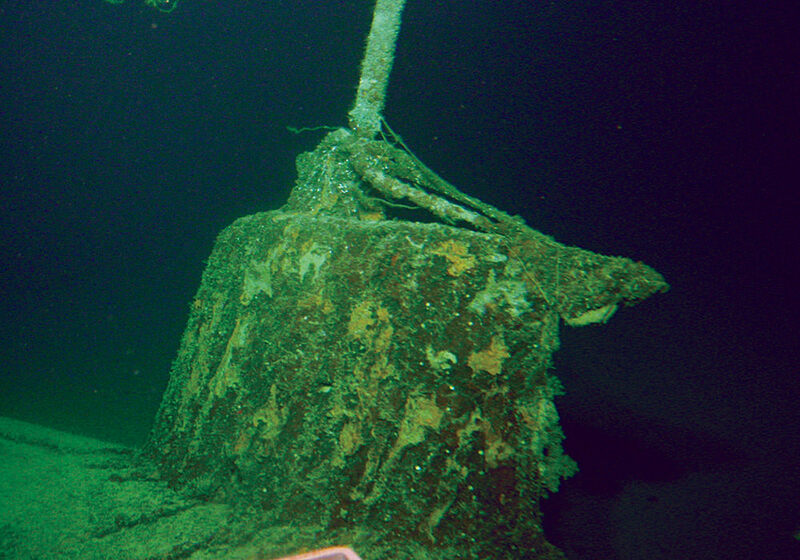 The conning tower of the mini submarine sunk by the USS Ward. 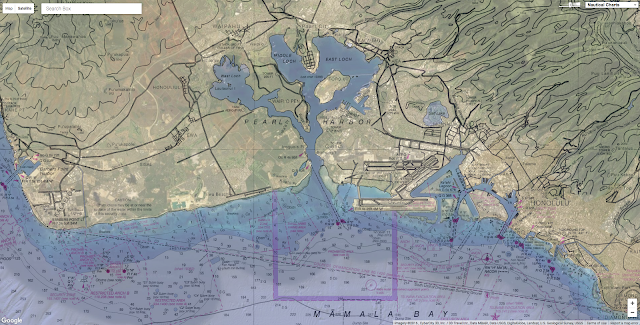 On the morning of December 7, 1941, U.S. naval vessels and aircraft on patrol outside Pearl Harbor spotted a partially submerged submarine trying to enter the harbor, but alerts were not immediately sent. Ninety minutes before Pearl Harbor was bombed by air, the destroyer USS Ward fired on the mini submarine, sinking the sub. The event marks the first U.S. shots fired and the country's entry into World War II in the Pacific. The NOAA team will dive on the wreck of this submarine. The second submarine to be explored during the dive disappeared on the morning of December 7, 1941. It was discovered in shallow waters in 1951, raised by the U.S. Navy, and taken out to sea to be dumped in deeper water. 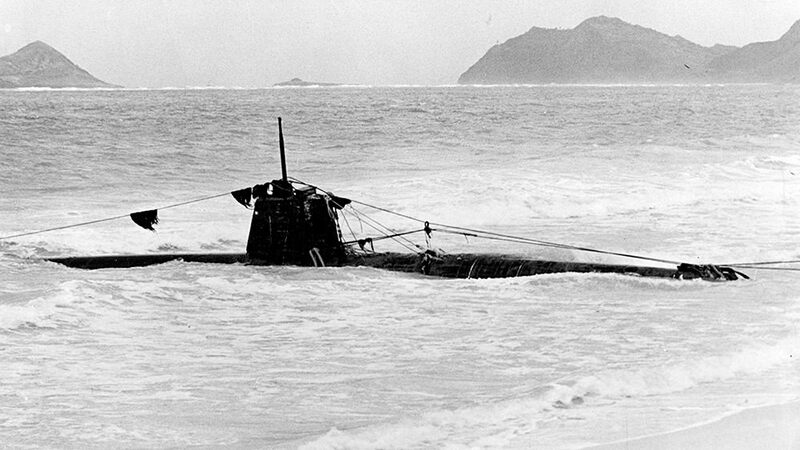 In 1992, the University of Hawaiʻi's Undersea Research Laboratory rediscovered it. It has been periodically visited by the university's submersibles, the last time in 2013.
wave-powered robots are enabling the "Blue Economy." On a planet mostly covered by water, there is plenty of dull, dirty and dangerous work to be done at sea, but robotics provides breakthrough capabilities that will transform how humans interact with the ocean. New technical capabilities and increasing market demand have converged to kick off an era of growth in autonomous, unmanned systems—an important component of the blue economy’s infrastructure. Picture a small ocean robot swimming deep beneath the sea. It could be searching, mapping, servicing equipment, or performing any number of other activities that we take for granted while living on the 28% of the planet that is not covered in water. This robot works in a hostile environment. Saltwater can short-circuit electronics and corrode metal, and deep under the ocean, water exerts a crushing pressure of tonnes per square inch. Closer to the surface, there are waves, wind and extreme weather. Sharks bite things to see if they’re edible, and algae and barnacles grow wherever they can, fouling mechanisms and sensors. The field of ocean robotics is decades old and, thanks to steady development and funding from organisations like the United States Office of Naval Research and oceanographic research labs around the world, many of the challenges it presents now have solutions. Energy, communications and market development have all been holding back the widespread adoption of ocean robotics. Fortunately, there’s now good news on all these fronts. The SHARC unmanned surface vehicle detected, reported, and tracked a manned submarine during the Unmanned Warrior exercise off the coast of Scotland in October 2016. Robotic autonomy isn’t just about artificial intelligence. For ocean systems, energy is the first constraint on how independent a robot can be. The most common robotic systems in the marine industry are remotely operated vehicles (ROVs) that are powered through a tether connected to a ship. Famously, several ROVs were deployed a mile deep to stop the oil gushing from the ocean floor after the catastrophic failure of the Deepwater Horizon rig. These ROVs, while often extremely sophisticated, are an extension of highly trained human crews living and working on specialised ships. Since ship operations are expensive, ship-based robot operations are even more expensive. Unmanned underwater vehicles (UUVs) achieve great agility and flexibility by eliminating the ROV’s tether, cutting the cord to the support ship. But this means that UUVs must rely purely on stored energy; their limited battery capacity constrains their range and the power available for sensors. Most UUVs are deployed from ships and operated in a similar way to ROVs. Improved battery technology, combined with low-power sensors and processors, is leading to rapid advances in the efficacy of long-range UUVs. Buoyancy gliders, a type of UUV, use hyper-efficient propulsion to spend months at sea and operate in a way that is truly unmanned—with no ship in sight. At the surface of the ocean, a newer class of autonomous ocean vehicles called unmanned surface vehicles (USVs) has emerged. Harvesting energy from wind, waves and the sun, USVs such as Liquid Robotics’ Wave Gliders convert natural energy to power propulsion, sensor payloads and communication devices. Boeing’s latest unmanned undersea vehicle (UUV) Echo Voyager. The 51-foot-long vehicle is the latest innovation in Boeing’s UUV family, joining the 32-foot Echo Seeker and the 18-foot Echo Ranger. The communications network for ocean robots is comprised of ocean robots, which are now being deployed in teams above, below and on the surface of the ocean. Radio waves and light don’t propagate through the ocean like they do through the atmosphere. Just a few centimetres of saltwater is enough to block radio and GPS signals. Sound, on the other hand, travels enormous distances underwater. Robots at the surface, equipped with acoustic modems and satellite links, are being used to extend communications and positioning services to a wide variety of subsea devices, including sea-floor sensors and UUVs. In combined deployments, aerial drones with optical sensors and surface robots with acoustic sensors co-operate to extend communication ranges and provide a persistent and agile monitoring system. A system-of-systems approach enables real-time, actionable updates for early detection, warning and monitoring. This network of robots will become more capable and valuable as it grows. Economies of scale mean that the more robots you build, the less each one costs. Without the need for fuel and human labour, operating costs can be very low. Reliability also improves with numbers, for each individual robot but also as the result of deploying slightly more robots than are necessary to complete a job. All this leads to a virtuous cycle of expanding utility and reduced costs as adoption grows. The network effect also applies to a growing, global ecosystem of sensor developers, platform manufacturers and integrators who provide creative solutions to diverse market needs in security, offshore industry, science and environmental assessment. Today, ocean robotics are in the same position as the iPhone was when Apple created it as a platform on which others would innovate and build—applications are at a nascent stage. This is changing as the underlying technology gains greater capabilities and is produced in greater volume. It’s an exciting time that will see a new industry of ocean application developers emerge. Imagine an ocean where networks of sensors, manned and unmanned systems, and satellites are connected to give us instant, affordable access to information. This is the vision for the digital ocean. It’s not science fiction: it’s a prerequisite for more-effective ocean preservation and economic expansion for the blue economy. The networked ocean will deliver real-time seismic warnings and more accurate hurricane and cyclone forecasts that will help save lives and economies. It will help expose illegal, unregulated and unreported fishing (IUU), and trafficking in drugs and people. Robots already help research, measure, and monitor precious marine ecologies. In the digital ocean, the insights we gain will foster new scientific discoveries, new job opportunities and new economic growth. In science fiction, robots don’t run out of power and can communicate from seemingly anywhere. In reality, powering devices and networking their data takes a lot of effort. But as these issues are addressed and the market matures, the opportunity for autonomous ocean devices is enormous. Ocean robotics is at an inflection point where it is ready to enable a safer, sustainable digital ocean. We asked yesterday if the pull of gravity is the same everywhere on Earth. As many of you noted, the answer is no. 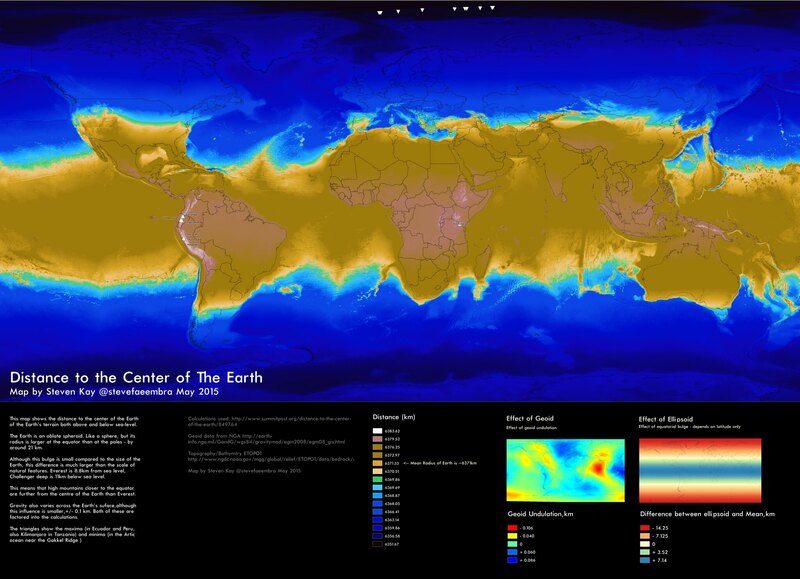 This map of Earth's gravity field, based on airborne and satellite measurements, depicts variations in Earth's gravity field. As Astronomy Picture of the Day explained when they ran a similar image in 2014: "High areas on this map, colored red, indicate areas where gravity is slightly stronger than usual, while in blue areas gravity is slightly weaker. Many bumps and valleys can be attributed to surface features, such as the North Mid-Atlantic Ridge and the Himalayan Mountains, but others cannot, and so might relate to unusually high or low sub-surface densities." In addition, processes happening deep in the Earth's mantle—such as descending tectonic plates and hot mantle plumes—can also affect the strength of the gravitational field. The geoid is a measurement of mean sea level (MSL). When you average out the motion of waves, the level at which water settles is MSL. To calculate MSL, all you have to do is just measure the average level of the oceans… and there you have it. But how about on land? Let’s say you dig a canal away from the ocean inwards to the land. The level the water would settle could be interpreted as mean sea level. And it’s used by surveyors to measure precise surface elevations as a true zero surface in a vertical datum. All objects on Earth fall at 9.81 m/s2 (meters, per second, per second). Gravity differs where you are on Earth, as shown in the geoid model. For example, mountains have more mass than valleys. As a result, gravity at the Rocky Mountains is relatively stronger to other locations on Earth. Gravity on the Earth’s surface ranges from 9.7639 m/s2 in Peru to 9.8337 m/s2 in the Arctic. This also means that our planet is actually very bumpy and non-uniform. It’s not as smooth that most people tend to think it is. The Earth bulges at the equator from rotational forces. This means the difference from the center of the Earth and the surface is smaller at the poles than at the equator. The material composition of the Earth varies and matter isn’t evenly distributed, which adds more complexity to understanding gravity. How do you measure the geoid? But you’d need a lot of tide gauges placed around the entire globe. So this is why satellites like NASA’s GRACE mission (Gravity Recovery and Climate Experiment) and ESA’s GOCE mission (Gravity Field and Steady-State Ocean Circulation Explorer) are measuring our planet’s gravity field with a precision never obtained before. How do these satellite missions do this? GRACE is a pair of satellites in the same orbit approximately 220 kilometers apart. When the leading satellite increases speed, this means there is a greater gravitational pull. If the leading satellite slows down, this means there is less gravitational pull. These tugs and pushes in gravity are measured using microwave pulses from one satellite to the other. Each satellite position is being pinned down with GPS. The end result is the most accurate measurements of gravity anomaly to date. 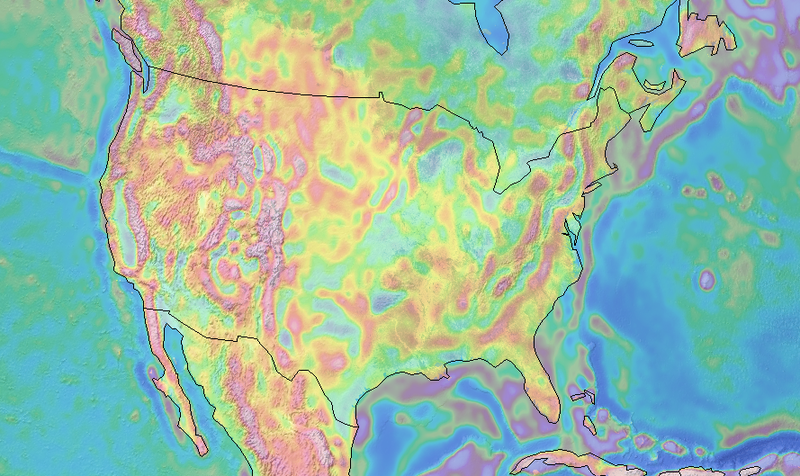 Geoid applications include weather forecasting, drought predictions, survey accuracy, water cycle, polar ice mass loss and anything that can track mass change. Earth’s Interior – Scientists are closer than ever to earthquake prediction. Because we can retrieve variations in the geoid, these subduction events are like retrieving earthquake signatures. Geoid variations were associated with more than 98 per cent of the earthquakes of magnitude 9 or above, around 60 per cent for magnitude 8.8, 40 per cent for magnitude 8.6 and 33 per cent for magnitude 8.3. If all the ice melted, climate scientists would measure change by the Earth’s rising sea levels and tide gauges. GRACE measures mass change from the melt of Arctic ice. It helps us understand if ocean circulation is changing and how if affects world climate change. As you walk around Earth, you weigh a little more or less depending on where you are. It’s actually a function of how much mass is below you. The geoid derived from the GRACE and GOCE missions can sense just how much that mass is. We love remote sensing applications. And the list goes on for these uniquely interesting satellite missions. Earthquake prediction, climate change models and the water cycle are some of the areas that the geoid is helping us understand how our Earth works. But the list of GRACE applications doesn’t stop here.